Israeli cyber security firm tells Reuters hackers broke into an Israeli defense ministry computer. Israeli officials won't comment. Hackers broke into an Israeli defense ministry computer via an email attachment tainted with malicious software that looked like it had been sent by the Israel Security Agency (Shin Bet), an Israeli cyber security firm told the Reuters news agency on Sunday. Aviv Raff, chief technology officer at Seculert, said the hackers earlier this month temporarily took over 15 computers, one of them belonging to the Civil Administration for Judea and Samaria. Raff told Reuters that Palestinian Arabs were suspected to be behind the cyber attack, citing similarities to a cyber assault on Israeli computers waged more than a year ago from a server in Hamas-ruled Gaza. While the latest attack was conducted from a server in the United States, experts noticed writing and composition similarities with the earlier attack, he told the news agency. Israeli officials declined to comment. "We are not commenting on it, we don't respond to such reports," Guy Inbar, a spokesman for the Civil Administration, told Reuters. Securlet had not determined what the hackers did after the initial infection, Raff said. "All we know is at least one computer at the Civil Administration was in control of the attackers; what they did we don't know," he told Reuters. A year ago, a person who claimed to be a Saudi hacker published the credit card information of some 400,000 Israelis. It was later revealed that the number of charge card accounts that had been hacked is about 15,000. The latest reported attack was in November, when Arab hackers broke into the Facebook accounts of some 13,000 Israelis, making public their usernames and passwords. In some cases they changed the profile pictures of the users in question. 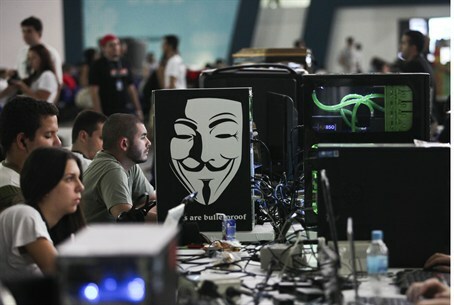 Experts have said that Israel faces roughly 100,000 cyber attacks on an average day. In times of war, the average number of daily attacks is roughly one million. The Defense Ministry has established a special cyber warfare administration, which coordinates the efforts of security agencies and the Israeli defense industry in developing advanced systems to deal with cyber warfare.